Calibration - ZYLIA PORTABLE RECORDING STUDIO. MULTI-TRACK MUSIC RECORDING WITH ONE MIC. The calibration process is required to identify positions of the instruments. You can either select a Preset calibration or Automatic calibration. ​It is recommended to perform calibration before every new rehearsal unless you always use identical instruments locations. If you change instrument location during your rehearsal you’ll need to repeat calibration for sources that changed the position. Each instrument must record a short sound sample. 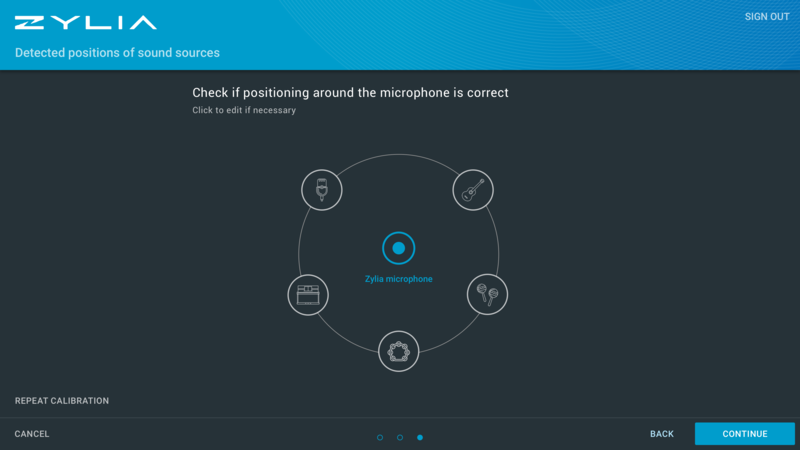 Based on that sample ZYLIA Recording Studio will identify a position of all instruments in the space around the microphone. During calibration make sure that all other sound sources (instruments) are quiet, play only the selected instrument. Using presets is very fast. You will have a quick access to Band or Surround presets. Band presets consists of Solo, Duet, Trio, Quartet, Quintet and Sextet settings. Whereas, Surround presets consists of Stereo Narrow, Stereo Wide, Stereo Binaural, 3.0 Surround Sound, 4.0 Quadraphonic Sound and 5.0 Surround Sound settings.